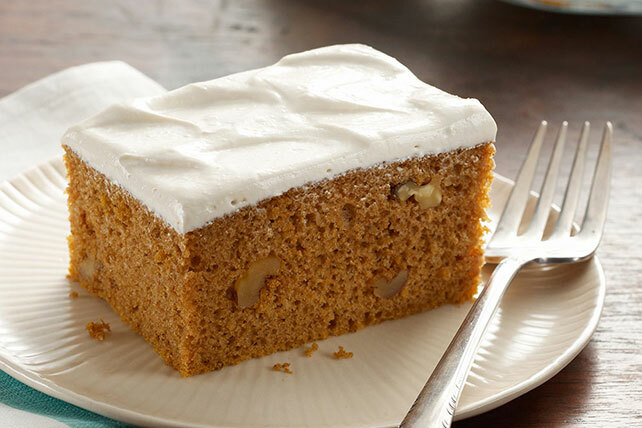 Add delicious fall flavor to a pumpkin spice cake with brown sugar frosting. Pumpkin Spice Cake with Brown Sugar Frosting features the perfect amount of sugar, spice and everything nice—plus delicious cream cheese. Beat first 5 ingredients in large bowl with mixer until well blended. Stir in nuts. Pour into 13x9-inch pan sprayed with cooking spray. Bake 30 to 32 min. or until toothpick inserted in center comes out clean. Cool completely. Beat Neufchatel and sugar in small bowl with mixer until well blended. Add COOL WHIP; mix well. Spread over cake. Remaining canned pumpkin can be stored in airtight container in freezer up to 3 months before using as desired.